Sculpture is living, it’s vital, it’s changeable. Even when you walk around it, it can be something different. Drawing is a reflection and coordinating eye and hand, but sculpture is your mind and an idea. 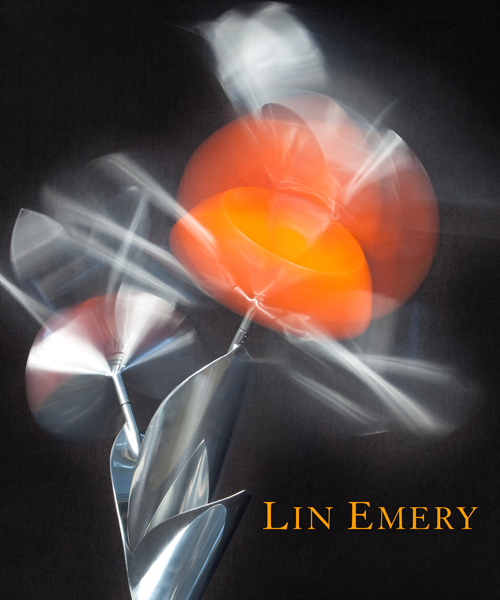 Inspired by the forms and forces of nature, Lin Emery’s gracefully undulating kinetic sculpture—constructed of highly polished abstract metal shapes—adorn museums and outdoor public spaces around the world. “I love the natural movement of the trees on the levees, the river, and anything in nature,” Emery says. The flowing motion of her structures are also propelled by natural forces; she began using water to power her structures 30 years ago and later utilized wind to also generate movement in her creations. The resulting revolving, twirling, and linked elements evoke plants, trees, clouds, or water.